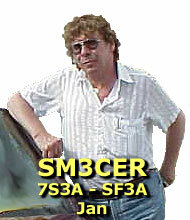 SM3CER Contest Service is not currently updated because Jan is home from hospital and recovering! Amateur Radio HF Contesting on 1.8 - 50 MHz. I started this site in April 1997 as a Contest Calendar mainly for Swedish contesters. It has grown from a few pages to almost 1.000 pages of information as of today. Im working with the site on my spare time and its just another hobby of mine. The only "official" rules on this site are for the Swedish domestic contests. When I find an official site for a contest I always have a link to it. Youll also find many interesting links, lots of contest software information and much more. Welcome to explore the site - have fun and I hope youll find it useful!